On Wednesday evening I went to see the bestselling Joanne Harris at my local Waterstones with a sense of eager anticipation. 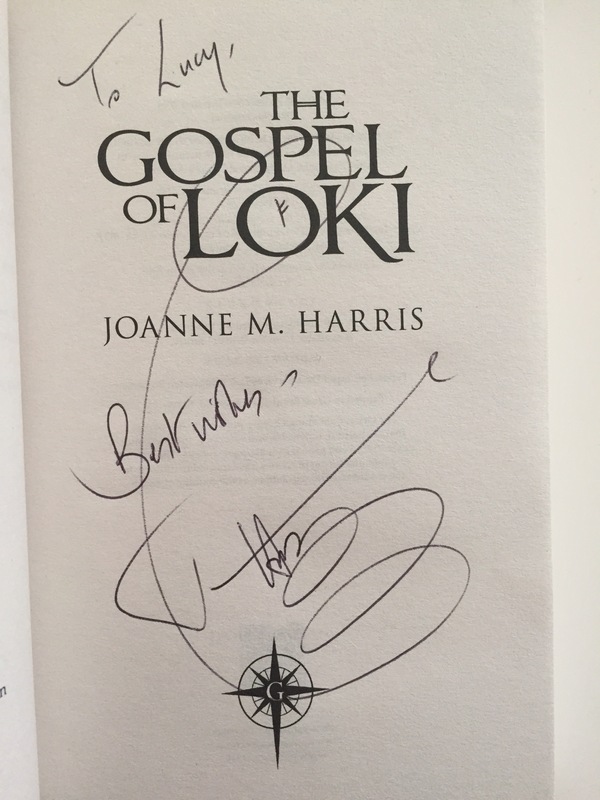 Having written such a diverse range of books, I wasn’t sure what to expect from her latest offering: The Gospel of Loki. As she enthused about her newest creation, I was mesmerised by the passion she had for her topic. She was an expert on Norse gods and mythology. She had read every reincarnation of the myths and had become so fascinated with the character of Loki that she felt compelled to write a version of the myths from his perspective. I find it hard to imagine being so intrigued by a character that you can’t accept what little is known of them so you decide to write a book to fill the gaps. But that’s exactly what she’s done. It wouldn’t usually be my kind of read but it was hard not to get carried away with her exuberance and passion. So, of course, I left the shop with a signed copy and I’m looking forward to getting started. I don’t only go along to these events to hear about the latest releases; I love to hear published writers talk about their journeys to success. In Joanne’s case, it all began in my own birth town of Barnsley. Her Saturday morning visits to Barnsley library introduced her to the world of books, fiction and particularly fantasy. It made me think about when I had first decided I wanted to become a writer and why. I think I was probably about 8 when I read The Secret Island by Enid Blyton. What a book! I just wanted to crawl into the pages and live with them on the island. It was then that I realised that I wanted to create people and places and worlds which were far more exciting than my own.